Event Description It's almost riding season again. 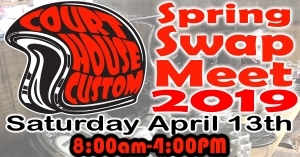 CHC will be hosting it's Semi-Annual swap meet so you can pick up those last minute items to finish your winter projects and get ready for the road. Entry and Vendor Spots are free. Please call or email CHC for more details or to reserve your spot. 740-335-2466 or chcustom@chcustom.com.